X-Ray is a type of radiography and most widely used investigation. It first appears too complicated to read the chest X-Rays because we barely know what lies where and what to make out of it. 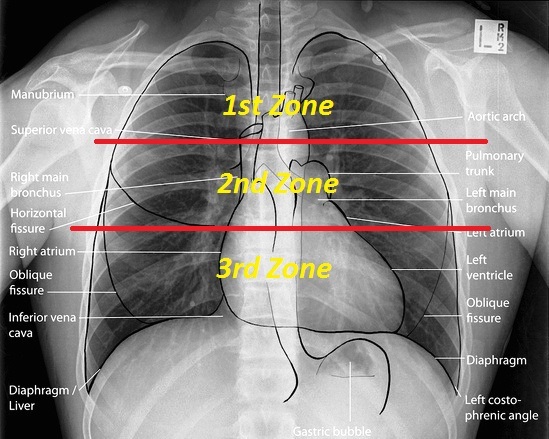 But the basics of Chest X-Ray here will guide you through various aspects, including Counting ribs, PA vs AP view, Inspiratory vs Expiratory X-Ray, Erect vs Supine, Lucency and Opacity and some common terms like Consolidation and Pleural Effusion. AP or Anteroposterior view- The view is from front to back. 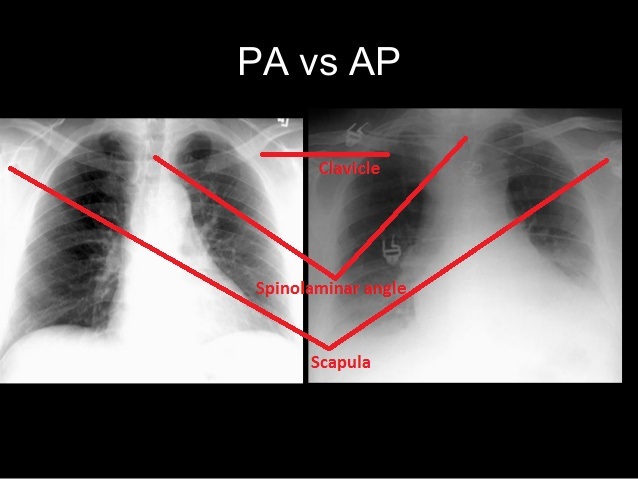 PA is most common X-Ray done where AP is usually done when the patient cannot stand and X-Ray machine is brought to him on bed and views are taken from anterior to posterior. 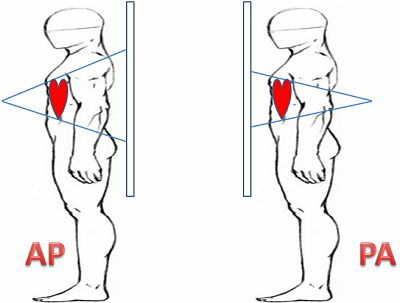 The point to add is that there is apparent Cardiomegaly in AP view as compared to PA view because there is a slight magnification of heart since the heart is away from view capturing film. There is fundal view in erect position because all the air in the stomach comes in fundus when the patient is standing. If the anterior end of 6th or 7th rib reaches mid-clavicular line of the diaphragm, it is Inspiratory X-Ray. The front opaque appearing side of ribs is actually its posterior side. Ribs are counted from anterior sides. Now let’s proceed to start studying the X-Ray. Anything that appears dark or black on chest X-Ray is said to be lucent. This is because of less density. Black color appears because of AIR. 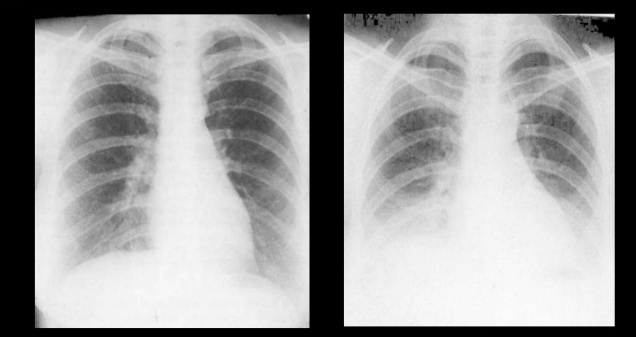 Anything that appears light or white on chest X-Ray is said to be Opaque. This is because of high density. White color appears because of Bones and soft tissues. Also seen in Plethora, i.e, increase I vascularity. 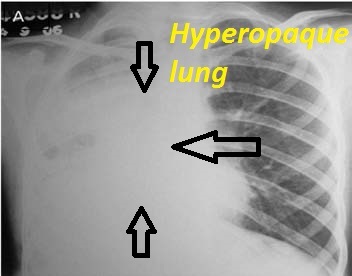 Displacement of interlobar fissure: because the lobes of lung collapse, the fissures in between the lobes move up or down because of hyperinflation of normal lobe against collapsed lobe. This is the most reliable direct sign of Collapse. Normally, there is no air in pleura. But effusion in pleura can occur. 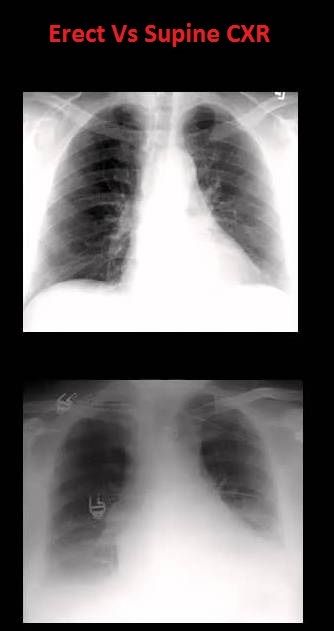 Mediastinal shift: which is on the opposite side, i.e, structures shift to the opposite side of pleural effusion. Note: Pleural effusion and Haemothorax cannot be differentiated because soft tissue cannot be differentiated on Chest X-Ray. Enjoyed reading? 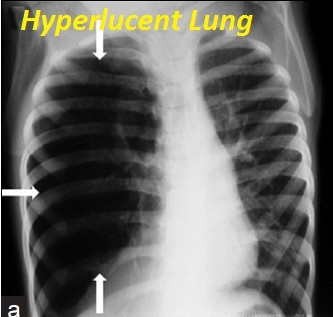 In our upcoming blog of Chest X-Ray, we will be explaining Silhouette sign (where exactly the abnormality is in the lung relating with an intervening border of an organ or its part) and some pathological diseases observed on chest X-Rays like pulmonary embolism, left ventricular failure, bronchogenic carcinoma, bronchiectasis, and lots more. Stay tuned.